"Broadway Express" redirects here. For the other service referred to as "Broadway Express", see N (New York City Subway service). For the album by J. J. Johnson, see Broadway Express (album). The Q Second Avenue/Broadway Express/Brighton Local is a rapid transit service in the B Division of the New York City Subway. Its route emblem, or "bullet", is colored yellow since it uses the BMT Broadway Line in Manhattan. The Q operates at all times between 96th Street/Second Avenue in the Upper East Side of Manhattan and Stillwell Avenue in Coney Island, Brooklyn. Daytime service makes express stops in Manhattan and local stops in Brooklyn; late night service makes local stops along its entire route. The Q was originally the Brooklyn–Manhattan Transit Corporation (BMT)'s 1 service; beginning in 1920, it ran along the BMT Brighton Line in Brooklyn and the BMT Broadway Line in Manhattan. In the past, the Q has run many different service patterns in Brooklyn, Manhattan and Queens, both local and express, including QB service on the Manhattan Bridge and QT service via the Montague Street Tunnel. From 1988 to 2001, Q service ran along the IND Sixth Avenue Line in Manhattan, with a bullet colored orange. The Q also ran in Queens at various points, including to Astoria–Ditmars Boulevard on the BMT Astoria Line from 2010-2016, Forest Hills–71st Avenue on the IND Queens Boulevard Line for a brief period in 2001, and 21st Street–Queensbridge on the IND 63rd Street Line until 2001. There was also a <Q> variant from 2001-2004, which ran express in Brooklyn and had its southern terminus at Brighton Beach. In 2017, the Q was rerouted along the Second Avenue Subway. On August 19, 1878, service was extended north from Prospect Park along what is today the BMT Franklin Avenue Line used by the Franklin Avenue Shuttle, to Atlantic Avenue west of Franklin Avenue, a location known as Bedford station on what is today the Atlantic Branch of the Long Island Rail Road (LIRR). :11 A physical connection existed between the Brighton, Flatbush and Coney Island Railway and the LIRR. By mutual agreement trains of the Brooklyn, Flatbush and Coney Island Railway ran on LIRR trackage west to its terminal at Flatbush Avenue and Atlantic Avenue, providing a connection to Downtown Brooklyn and ferries to Manhattan. LIRR trains also operated to Brighton Beach from Flatbush Avenue and from its own terminal in Long Island City, with ferry access to Midtown Manhattan. Initially, service operated during the summer season only. At the end of the 1882 summer season, the LIRR abrogated its agreement allowing Brighton Line trains to access its Flatbush Avenue terminal and beginning with the 1883 summer season, only Brooklyn, Flatbush and Coney Island trains operated between Bedford Terminal and Brighton Beach. In 1908, a massive grade crossing elimination project was completed with a 4-track line from south of Church Avenue station to Neptune Avenue near the Coney Island Creek, permitting true local and express service, as pioneered on the New York City Subway that opened in 1904.:22 The Brighton Beach line was also converted to electrified third rail. Brighton Beach local and express service was extended to a new West End terminal at Stillwell and Surf Avenues, the location of the Coney Island terminal for the BMT Southern Division, in May 1919. On August 1, 1920, subway service on the BMT Brighton Line, now owned by the Brooklyn-Manhattan Transit Corporation (BMT), officially began with the openings of a two-track underground subway between Prospect Park and DeKalb Avenue and the Montague Street Tunnel between Brooklyn and Manhattan. :285 This subway service was labeled 1 by the BMT starting in 1924. 1 Brighton Express service operated during the daytime every day except Sunday between Brighton Beach and Times Square-42nd Street in Manhattan via the Montague Street Tunnel and the BMT Broadway Line. 1 Brighton Local service operated between Coney Island and 57th Street–Seventh Avenue via the north side tracks of the Manhattan Bridge and the Broadway Line. During late nights, all trains used the tunnel. Three years later, the Brighton Locals and Expresses switched Manhattan access methods with the express using the bridge when it ran and local service using the tunnel except in the evenings and on Sunday, when it too used the bridge. During the 1930s, limited morning rush hour service ran via the south side tracks of the Manhattan Bridge and the Nassau Street Loop to Chambers Street on the BMT Nassau Street Line. On June 29, 1950, trains began running there during the evening rush as well. On October 17, 1949, the IRT Astoria Line in Queens, up to this point operated by the Interborough Rapid Transit (IRT), was converted to BMT operation. 1 Local trains were extended via the 60th Street Tunnel and the BMT Astoria Line to Astoria–Ditmars Boulevard during rush hours. Number 2 Fourth Avenue Local trains also ran here at all times. On April 27, 1950, 1 Local trains operated through to Astoria-Ditmars Boulevard all day on weekdays and Saturdays. On June 26, 1952, 1 Express trains were extended to 57th Street–Seventh Avenue on weekdays after the morning rush hour and all day on Saturdays. The 60th Street Tunnel Connection opened on December 1, 1955, connecting the Broadway Line to the IND Queens Boulevard Line. 1 Local trains were rerouted to this new connector to Forest Hills–71st Avenue in Forest Hills, Queens. They were replaced on the BMT Astoria Line by 1 Express trains on weekdays. On May 4, 1957, trains running express in Brooklyn started running to Astoria on Saturdays as well, but made local stops in Manhattan as the local trains in Brooklyn now ran to Chambers Street via the BMT Nassau Street Line. The final portion of the Broadway Line's express tracks, between Times Square–42nd Street and 57th Street–Seventh Avenue, was placed in service on May 2, 1957. 1 Brighton Express trains ran local in Manhattan on Saturdays while Brighton Locals ran express here during evenings and on Sundays. This lasted only until the next service change. On October 24, 1957, Brighton Local trains ran via the Manhattan Bridge and local in Manhattan, all day on Sundays as well as evenings and midnight hours. Brighton Express 1 service on weekdays began using the express tracks between Times Square–42nd Street and 57th Street–Seventh Avenue. A December 1957 strike shut down much of the BMT Division. Brighton Local 1 trains ran in two sections, from Coney Island via tunnel to 57th Street-Seventh Avenue and from Whitehall Street to Jamaica–179th Street on the IND Queens Boulevard Line. Due to the differing unions predominating on the various divisions, the IND was completely knocked out of service, while the IRT ran virtually normal service. The BMT was about half affected, with makeshift service patterns being set up for the duration of the strike. On May 28, 1959, 1 Brighton Express trains midday on weekdays were cut back to 57th Street–Seventh Avenue and made local stops in Brooklyn midday. Nassau Specials returned, running via the Montague Street tunnel during the morning rush and via the Manhattan Bridge during the evening rush. As part of the same service change, Brighton Local trains (beginning June 6) ran to Franklin Avenue on Saturdays. This was not seasonal and ran the entire day, being quite distinct from the Sunday service which still operated. On November 15, 1960, with the arrival of the R27 subway cars, 1 service on the Brighton Line was relabeled. Brighton Express service was designated as Q, Brighton Local via the Montague St Tunnel as QT, and Brighton Local via the Manhattan Bridge as QB. Single letters were used to refer to express lines and double letters for local lines, a practice that began thirty years earlier with the Independent Subway System (IND), however, no QQ designation was ever used. Despite these new designations, subway communications continued to refer to the services as "Brighton Local" and "Brighton Express". On January 1, 1961, Q Brighton Express service was cut back from Astoria-Ditmars Boulevard to 57th Street–Seventh Avenue on weekdays. Saturday daytime service continued to run to Astoria-Ditmars Boulevard. QT service ran to Astoria–Ditmars Boulevard on weekdays; on Saturdays, it ran via the Franklin Avenue Line to Franklin Avenue in Brooklyn instead. The QB provided off-peak service between Coney Island and Astoria, via Brighton Local and the Manhattan Bridge. Sunday service between Franklin Avenue and Brighton Beach was discontinued on this date, with Sunday service now provided solely by the Franklin Avenue Shuttle between Prospect Park and Franklin Avenue-Fulton Street. Service between Brighton Beach and Franklin Avenue was merged into the Franklin Avenue Shuttle service on October 14, 1961, and all non-shuttle service between was discontinued in February 1963. The Fourth Avenue Local (RR) now provided Broadway Line service along the Queens Boulevard line on weekdays, and the West End Express (T) was extended from 57th Street-Seventh Avenue to Astoria-Ditmars Boulevard during rush hours. This service change essentially swapped the northern terminals of the Brighton Local and RR, and between the Brighton Express and (T). Prior to this both Brighton Line-Broadway services operated via the 60th Street Tunnel to Queens. By having the Brighton Express Q terminate at 57th Street-Seventh Avenue, this change served to keep one Brighton Line service unaffected in the event of a massive delay in the 60th Street Tunnel. From February 10 to November 2, 1964, the Brighton Express tracks were closed for platform extensions. Skip-stop service was instituted along the Brighton Line. On November 26, 1967, the Chrystie Street Connection opened, connecting the Brighton Line in Brooklyn to the IND Sixth Avenue Line in Manhattan via the Manhattan Bridge. The bridge's south side tracks, which formerly connected to the BMT Nassau Street Line, were now connected to the Broadway Line express tracks, severing the Nassau Street Loop. The bridge's north side tracks, which formerly connected to the Broadway Line, now connected to the Sixth Avenue Line express tracks. Originally, the D, running via Sixth Avenue Express and QJ, running via the BMT Nassau Street Line and Montague Street Tunnel were to replace all three Q services on the Brighton Line. The Q and QT were eliminated, but due to riders' opposition to the expected loss of all Broadway Line service, the QB was retained, now running rush hours only in the peak direction, via Brighton Local, the Manhattan Bridge and Broadway Express in Manhattan, between Coney Island and 57th Street-Seventh Avenue. The color scheme introduced for subway lines that day included a red QB bullet. A short-lived NX service also provided rush-hour service between Brighton Beach and Coney Island and the Broadway Line, running via the BMT Sea Beach Line to Manhattan. This service was discontinued on April 15, 1968, after less than five months. The RR replaced Q, QB and QT service to Astoria-Ditmars Boulevard in Queens. In 1979, the MTA released a revised coloring scheme for subway routes based on trunk line; the QB service was assigned the color sunflower yellow, with black text, because it used the BMT Broadway Line in Manhattan. It now used a diamond-shaped bullet because it ran rush hours only. On May 5, 1985, the double-letter naming scheme for local services was dropped; the QB was renamed the Q the next day. Starting on April 26, 1986, the Brighton Line's local tracks underwent reconstruction between Prospect Park and Newkirk Avenue, requiring the suspension of express service; at the same time, reconstruction of the Manhattan Bridge started, which would disrupt subway service until 2004. The bridge's north side tracks (leading to the Sixth Avenue Line) closed. The Q now ran weekdays from 7 AM to 8 PM between 57th Street-Seventh Avenue and Brighton Beach, using a circle bullet. Because the Manhattan Bridge's north side tracks closed, the D and Q ran on the bridge's south side tracks, running via Broadway Express to 57th Street-Seventh Avenue. To substitute for the suspended Brighton Line express service, the Q ran skip-stop service with the D between Newkirk Avenue and Sheepshead Bay. D trains served Neck Road, Avenue M and Avenue H; the Q skipped those stops, serving Avenue U and Avenue J, while both lines served Kings Highway. By 1987, as reconstruction on the Brighton Line progressed, the weekday skip-stop pattern expanded to Prospect Park, with D trains serving Beverley Road while Q trains served Cortelyou Road and Parkside Avenue, with Church Avenue as a mutual station. On December 11, 1988, the Bridge's north side tracks reopened and the south side tracks closed, and the reconstruction project on the Brighton Line ended. The Q became the weekday Brighton Express to Brighton Beach and was rerouted via the north side of the bridge and the IND Sixth Avenue Line to 57th Street, Midtown Manhattan. Because it ran on the Sixth Avenue Line in Manhattan, the route now used an orange bullet. On October 29, 1989, the IND 63rd Street Line opened and the B, Q, and JFK Express were extended to 21st Street–Queensbridge in Long Island City. On weekday evenings and late nights, trains ran between 21st Street–Queensbridge and Broadway–Lafayette Street as Q trains, with trains continuing as F trains to Coney Island. The weekday evening shuttle was replaced by the B on September 30, 1990. The F replaced the late night shuttle in 1993. On April 30, 1995, the north side of the Manhattan Bridge closed during middays and weekends, in addition to the already-closed south side. During these hours, D service was cut below 34th Street-Herald Square. In its place, the Q ran between Coney Island and 21st Street-Queensbridge, via Brighton Local, the Montague Street Tunnel, Broadway Express (switching between the local and express tracks at Canal Street) and the BMT 63rd Street Line. Rush hour and evening service was unchanged. Normal service resumed on November 12, 1995. On February 22, 1998, construction on the IND 63rd Street Line cut B and Q service back to 57th Street–Sixth Avenue. Service on the 63rd Street Line was replaced by a shuttle to the BMT Broadway Line. Normal service resumed on May 22, 1999. On July 22, 2001, the Manhattan Bridge's north side tracks closed and the south side tracks reopened. There were now two Q services. In Brooklyn, the circle Q (Q local) replaced the D as the full-time Brighton Local to Stillwell Avenue while the <Q> (Q express or Q diamond) replaced the Sixth Avenue Q as the weekday-only Brighton Express to Brighton Beach. Both Qs used the south side of the Manhattan Bridge to travel into Manhattan and then ran to 57th Street–Seventh Avenue via Broadway Express. Service on the IND 63rd Street Line was replaced by a shuttle, which would be permanently replaced by the F in December 2001. After September 11, 2001, Broadway Line service through Lower Manhattan, and R service were suspended. The Q local replaced the R between Canal Street and Forest Hills–71st Avenue, making local stops in Manhattan and Queens at all times except late nights, when it terminated at 57th Street–Seventh Avenue. This was the predecessor to the Astoria-Ditmars extension (see below). Both services returned to normal on October 28, 2001. On September 8, 2002, Coney Island–Stillwell Avenue (the Q's southern terminal) was closed for reconstruction and the Q local terminated at Brighton Beach. During this time, service at stations between Brighton Beach and Stillwell Avenue was replaced by an extension of the B68 bus. Q service to Stillwell Avenue resumed on May 23, 2004. From April 27 to November 2, 2003, the south side of the Manhattan Bridge was closed on weekends and Q service was rerouted via the Montague Street Tunnel. On February 22, 2004, reconstruction of the Manhattan Bridge was completed and full service was restored. The <Q> express was discontinued and replaced with the B in Brooklyn and N in Manhattan to combine two weekday-only lines. The Q remained unchanged. Map of the full Second Avenue Subway (SAS), showing the planned uptown portion of the Q route, which currently terminates at 96th Street. On June 28, 2010, the Q was extended from 57th Street–Seventh Avenue to Astoria–Ditmars Boulevard via the 60th Street Tunnel and BMT Astoria Line on weekdays, stopping at 49th Street, to replace the W, which was discontinued due to budget problems. On December 7, 2014, the Q began operating local in Manhattan between 57th Street-Seventh Avenue and Canal Street during late nights, in order to decrease waiting time at the local stations. On November 7, 2016, weekday Q service was cut back from Astoria to 57th Street-Seventh Avenue, skipping 49th Street, to provide a seamless transition for the opening of the Second Avenue Subway. Service to Astoria and the 49th Street station was replaced by a restored W service. Late night service continues to serve 49th Street. On January 1, 2017, the first phase of the Second Avenue Subway opened; the Q was extended from 57th Street-Seventh Avenue to 96th Street via the BMT 63rd Street Line and the IND Second Avenue Line. This extension serves Lexington Avenue–63rd Street station with a cross-platform transfer to the IND 63rd Street Line (served by the F train) before serving new stations under Second Avenue at 72nd Street, 86th Street, and 96th Street, where it originates/terminates. The inaugural train on the Second Avenue Line ran on December 31, 2016, with passenger service beginning the next day. From January 1 to 9, 2017, service between 57th Street-Seventh Avenue and 96th Street ran only from 6 AM to 10 PM, with late night service terminating at 57th Street-Seventh Avenue; late night service to 96th Street began on January 9. Service continues to operate local in Manhattan at night. The second phase of the Second Avenue Line will extend the Q to a new northern terminal at Harlem–125th Street, with planned stops at 116th Street and 106th Street. At the Harlem–125th Street terminus, there will be a transfer to the existing 125th Street station on the IRT Lexington Avenue Line and a connection to Harlem–125th Street station on Metro-North Railroad. This will provide residents of East Harlem with direct subway service via Second Avenue and Broadway to the Upper East Side, western Midtown, Lower Manhattan and Brooklyn, and offer connections to 4, ​5, ​6, and <6> trains and Metro-North from the Bronx, the northern suburbs of New York City, and southern Connecticut. Under the plan approved by the Federal Transit Administration, the MTA estimates to complete Phase 2 between 2027 and 2029. J ​Z (BMT Nassau Street Line) Stops on the lower level. ^ This bullet was used when the service ran via the IND Sixth Avenue Line in Manhattan. The main logo for the 2003 musical Avenue Q parodies this bullet. ^ a b "Q Subway Timetable, Effective June 24, 2018" (PDF). Metropolitan Transportation Authority. Retrieved June 24, 2018. ^ Linder, Marc; Zacharias, Lawrence S. (December 1, 1999). Of Cabbages and Kings County: Agriculture and the Formation of Modern Brooklyn. University of Iowa Press. p. 144. ISBN 9780877457145. ^ a b c d Cudahy, Brian J. (January 1, 1999). The Malbone Street Wreck. Fordham Univ Press. ISBN 9780823219322. ^ a b Derrick, Peter (April 1, 2002). Tunneling to the Future: The Story of the Great Subway Expansion That Saved New York. NYU Press. ISBN 9780814719541. ^ Cudahy, Brian J. (January 1, 1995). Under the Sidewalks of New York: The Story of the Greatest Subway System in the World. Fordham Univ Press. p. 73. ISBN 9780823216185. ^ New York City: Vol 1, New York City Guide. New York: Random House. January 1, 1939. p. 13. ISBN 9781623760557. ^ a b "BMT Riders: Changes In Routes! January 1". Flickr.com. New York City Transit Authority. January 1961. Retrieved May 17, 2016. ^ "the NX joins the N..." thejoekorner.com. New York City Transit Authority. April 1968. Retrieved May 6, 2018. ^ Grynbaum, Michael M. (May 10, 2010). "Take the Tomato 2 Stops to the Sunflower". The New York Times. Retrieved October 30, 2016. ^ "Hey, What's a "K" train?". Flickr.com. New York City Transit Authority. 1985. Retrieved June 17, 2016. ^ "Brighton Line Riders: Your Guide To Service Changes On The D Q M During Rehabilitation Work April 26 Through October 26, 1986". thejoekorner.com. New York City Transit Authority. 1986. Retrieved February 8, 2018. 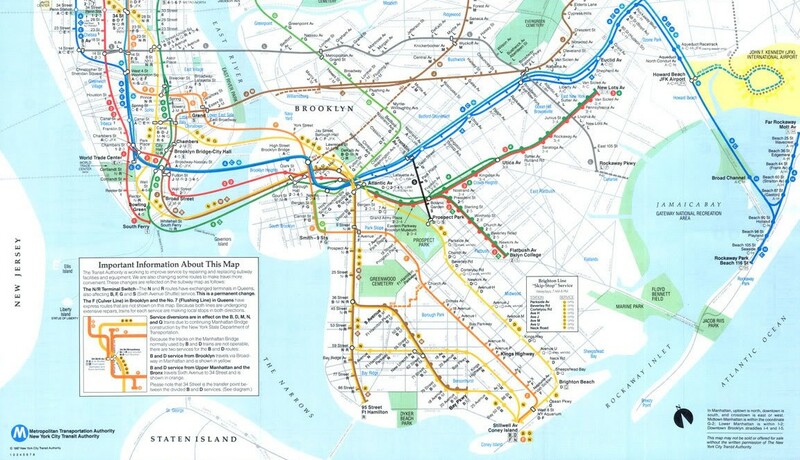 ^ "May 24, 1987 New York City Subway Map". stewartmader.com. New York City Transit Authority. May 24, 1987. Retrieved May 6, 2018. ^ "October 1989 Map". Flickr. New York City Transit Authority. October 1989. Retrieved October 7, 2018. ^ Ronald Sullivan (March 26, 1995). "Bridge Repairs to Disrupt Off-Peak Subway Service". The New York Times. Retrieved July 2, 2016. ^ "63rd Street Shuttle Timetable". thejoekorner.com. New York City Transit Authority. February 1998. Retrieved October 23, 2016. ^ "Q Train Timetable" (PDF). mta.info. Fall 2003. Archived from the original (PDF) on December 3, 2003. Retrieved May 6, 2018. ^ Chan, Sewell (May 28, 2005). "And Now for the Good News From the Subway System". The New York Times. ISSN 0362-4331. Retrieved August 15, 2016. ^ Son, Hugh (February 15, 2004). "ABC's of subway swap Manhattan Bridge fix changes 7 lines". New York Daily News. Retrieved February 25, 2018. ^ "Major Subway Changes Set for Monday". mta.info. June 24, 2010. Retrieved October 20, 2016. ^ "A Look Inside MTA New York City Transit's Sign Shop". mta.info. Metropolitan Transportation Authority. October 17, 2014. Retrieved October 19, 2014. ^ Donohue, Pete (April 24, 2014). "Q train will make more local stops come December". New York Daily News. Retrieved October 23, 2016. ^ "Revised Broadway Service". mta.info. Metropolitan Transportation Authority. Retrieved November 3, 2016. ^ Martinez, Jose (February 20, 2016). "MTA Confirms W Train is Coming Back". TWC News. Retrieved February 20, 2016. ^ "MTA Advances Work On Second Avenue Subway Service". mta.info. Metropolitan Transportation Authority. February 19, 2016. Retrieved February 19, 2016. ^ Slotnik, Daniel E.; Wolfe, Jonathan; Fitzsimmons, Emma G.; Palmer, Emily; Remnick, Noah (January 1, 2017). "Opening of Second Avenue Subway: Updates". The New York Times. ISSN 0362-4331. Retrieved January 1, 2017. ^ "Second Avenue Subway to Open On-Time". mta.info. Metropolitan Transportation Authority. December 19, 2016. Retrieved December 19, 2016. ^ "Q Service operates between Stillwell Av and 57 St-7 Av Late Nights, 10 PM to 6 AM, until Monday, Jan 9". mta.info. Metropolitan Transportation Authority. January 2017. Archived from the original on January 9, 2017. Retrieved January 9, 2017. ^ "CM-1190 Consultant Design Services for Phase 2 of the Second Avenue Subway Project" (PDF). mta.info. Metropolitan Transportation Authority. March 4, 2016. Retrieved August 27, 2017. ^ "Second Avenue Subway Phase 2 New York, New York New Starts Project Development Information Prepared December 2016" (PDF). Federal Transit Administration. December 27, 2016. Retrieved January 4, 2017. Wikimedia Commons has media related to Q (New York City Subway service). "Q Subway Timetable, Effective June 24, 2018" (PDF). Metropolitan Transportation Authority. Retrieved June 24, 2018.